Happy Friday Wyrdos! We are continuing our trend of looking at some of the coolest models of The Other Side, the Titans. Today we preview the might of the Abyssinian army, the Dreadnought. The Dreadnought embodies the Abyssinian design philosophy. Its three-legged design allows it to easily cross any sort of terrain, including the rocky regions of southern Abyssinia. It can even raise or lower itself to allow its operators to see past obstacles or hide behind cover. Similarly, its weaponry is relatively simple, which makes the Titan easy to manufacture (though they are sometimes equipped with experimental weaponry the empire's scientists wish to test out). Perhaps most importantly to the Abyssinian design philosophy is that it relies on the Abyssinian people. The Dreadnought has multiple drivers and gunners, ensuring that the machine is always under Abyssinian control while acting with the mind of a person. The powerful Dreadnought is a fairly recent addition to the Abyssinian forces. It was brought into service after a number of malfunctions by fully automated guns made it clear that the nation needed to have a mobile gun platform that was less risky to individual soldiers. For now, the Dreadnought has been a great boon to Abyssinian forces, and they are quickly becoming an iconic part of an Abyssinian assault. On the tabletop, Dreadnoughts are high Armor models with decent speed. They focus on Missile Actions, but as a Titan, they can use these even if they are engaged with standard troops. 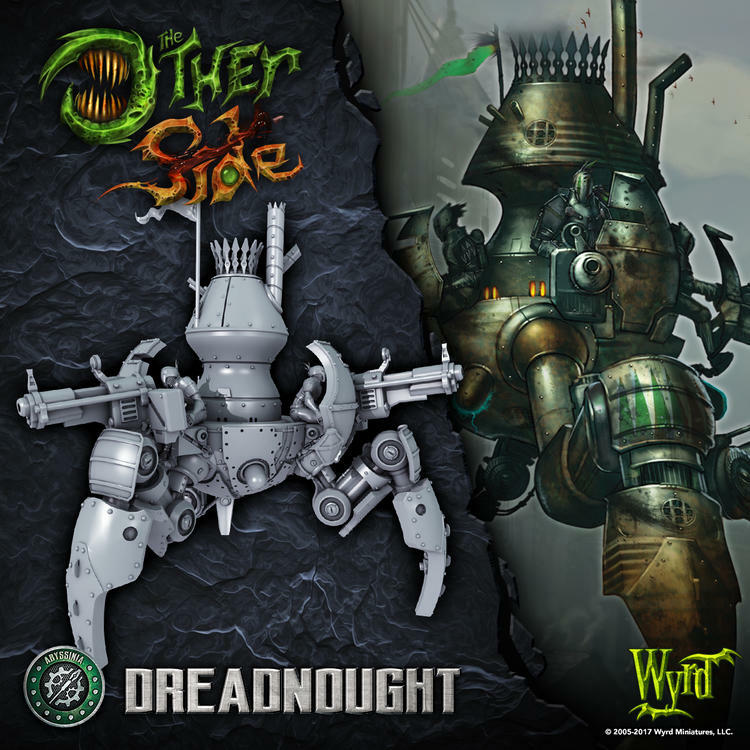 Dreadnoughts function best in the thick of things. A good Rush Order can cause Crushing Legs to deal damage to the enemy, as can the Titan's Stabbing Steel Leg. After that, the Dreadnought can unload with its Versatile Actions, making it a fast moving warmachine that will quickly become a feared aspect of every battle. Like all Titans, the Dreadnought loses effectiveness as it takes damage, so ensuring that it chooses its battles carefully is important. If you are in a good position, however, it can also charge into the battle to tie up enemy forces, effectively sacrificing itself to deal maximum damage to the enemy. I really like how, despite the high number of technological advancements, humanity and tradition seem to be so important to Abyssinia: they really define their technology rather then being defined by it. It's a really cool theme and I look forward to getting them on the table and reading more about their fluff! I enjoy reading the background stories and whilst not from my declared factions this is a great looking model that will doubtless launch a myriad of paint schemes - can't wait ! This thing looks PHENOMENAL! I can't wait to paint it! I cant wait to PLAY it!! I love how the Assets, really change the tactical application of the Dread on the field.